1960 Book. Mini Sized. 55th Birthday Gift or 55th Anniversary Gift. This is a 1960 book of over 60 glossy colored pages with a hard cover. 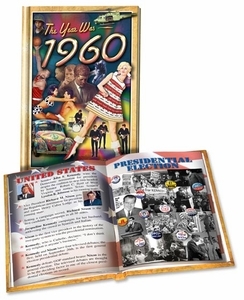 It has a scrapbook style format containing photos from 1960, news headlines, tops stories and a lot of trivia such as music, prices, sports, oscars, television, etc. Measurements are 6 1/4" by 4 1/4". It might be a smaller sized gift, but is inexpensively priced and is an excellent value for any trivia lover. This is probably one of our most popular 55th gift ideas. Turn to page 32 for an interesting fact. See also our other 55th wedding anniversary gifts.